Perform this inspection as follows after removal, installation, or replacement of the camshaft or any valve parts, or if there are any unusual engine conditions due to changes in valve clearance over time (starting, idling, and/or noise). Remove the fender protector side cover (RH). Refer to EXT-28, "FENDER PROTECTOR : Exploded View". Remove the rocker cover. Refer to EM-37, "Exploded View". 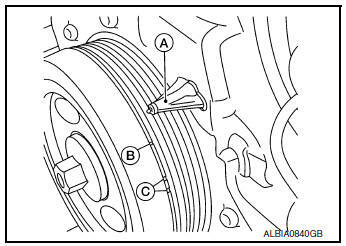 Turn crankshaft pulley clockwise when viewed from front to align TDC identification mark (B) with timing indicator (A). NOTE: Do not confuse TDC mark (B) with paint marks (C). At this time, check that the both intake and exhaust cam lobes of No. 1 cylinder face outside. If they do not face outside, turn crankshaft pulley once more. Measure valve clearances with a suitable tool at locations marked (X) in the table below. Use a suitable tool to measure the clearance between valve lifter and camshaft. 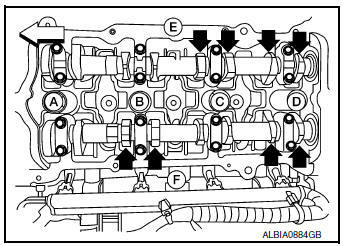 Valve clearance: Refer to EM-116, "Camshaft". Turn crankshaft one complete revolution (360°) and align mark on crankshaft pulley with pointer. If out of specifications, make necessary adjustment. Perform adjustment by selecting the valve lifter with the correct head thickness. Remove camshaft. Refer to EM-64, "Exploded View". Remove the valve lifters at the locations that are outside the standard. Measure the center thickness of the removed valve lifters with a suitable tool (A). Use the equation below to calculate valve lifter thickness for replacement. t = Thickness of replacement valve lifter. t1 = Thickness of removed valve lifter. 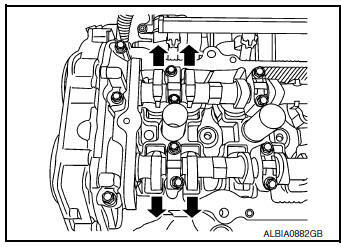 C1 = Measured valve clearance. C2 = Standard valve clearance. Thickness of a new valve lifter (B) can be identified by stamp marks (A) on the reverse side (inside the cylinder). Stamp mark 324H indicates a thickness of 3.24 mm (0.1276 in) Available thickness of valve lifter: 26 sizes with a range of 3.00 to 3.50 mm (0.1181 to 0.1378 in), in steps of 0.02 mm (0.0008 in), when assembled at the factory. Install the selected valve lifter. Install camshaft. Refer to EM-64, "Exploded View". Install timing chain and related parts. Refer to EM-44, "Exploded View". Manually rotate crankshaft pulley a few rotations. Check that valve clearances for cold engine are within specifications by referring to the specified values. 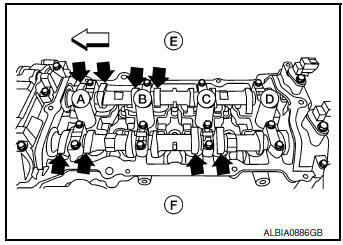 Valve clearance Refer to EM-116, "Camshaft". Install all removed parts in the reverse order of removal. Warm up the engine, and check for unusual noise and vibration.